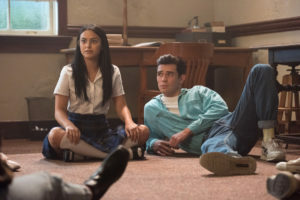 Riverdale went back to the 80s in its highly anticipated flashback episode. Our very own version of The Breakfast Club, aptly named The Midnight Club, is all about friendship, fun and games, secrets, and death. There are a few revelations mixed in there, as well, so buckle up and let’s go for a ride down memory lane. Back in the day the key players were Alice Smith (a rebel girl from the Southside), Hermione Gomez (a good Catholic girl with mediocre means and larger aspirations), Penelope Blossom (an obnoxious, bratty know it all), Fred Andrews (an all-around musically inclined good guy who taking care of his ailing father), FP Jones (also from the Southside, didn’t want to be a Serpent like his dad and wanted to get out of town), and Sierra Samuels (a girl with no political aspirations who loved a boy that she shouldn’t). There are a few additional minor players but we will get to them. 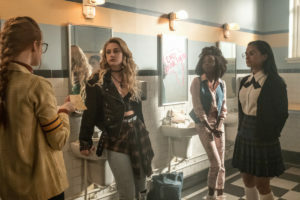 It all started at the school in detention one day: Alice and Penelope got into a fight in the bathroom while Hermione and Sierra tried to break it up while Fred and FP were streaking down the halls. They hardly knew one another and didn’t get along at first, but boredom befell them and after getting into trouble again to secure more unsupervised detention together, they began to come together as friends and – eventually – broke into a teacher’s desk where they found a vintage version of Gryphons and Gargoyles. Penelope was the “game master” who would lead them through different quests in the game. The gameplay got to a point where they stopped using the board and eventually started breaking into the school at night to continue their real-life quests, hence The Midnight Club. Dressing up to bring their characters to life int he same vein as the live-action role-playing (LARPing) we have today, one night they happen upon another group of players running around the school at night: Tom Keller, Marty Mantle, Hiram Lodge, and Daryl Doiley. The two groups join forces and it’s not long before they all receive an invitation in their lockers from the Gargoyle King to “rise to the challenge and ascend to the next level.” When the group meets up as requested, they find a whole game set up. The goal is to find the chalices, flip the griffin coin, and drink in order to meet their destiny. When Hermione complains that it’s not much of a party, Hiram pulls out some “Fizzle Rocks” which seem to be the pre-jingle jangle teen drug of choice and a wild party ensues complete with a performance from the Fred Heads featuring Fred, Alice, Hermione, FP, and Sierra. Alice abstained from partaking in the fizzle rocks as she was pregnant at the time (remember Betty’s older brother that she never met?) and only she could see the entirety of the insanity of the night. Unfortunately, she began feeling unwell and ran to the bathroom to throw up where she found two chalices at the sink and the girl’s bathroom completely covered in graffiti that said, “flip for your fate.” Thankfully, she got spooked and left before drinking anything. Alice spotted the Gargoyle King in a hallway but had to hide when she heard the front doors of the school open and the principal walked in. Shortly after, she leaves the school and Alice has no idea what happened the rest of the night. The first fracture in the group came from Fred coming home to find his father dead. Not being there when his father left the earth killed Fred and, on top of it, their principal had gone missing the same night as the party. Eventually, they found their school principal dead, stuffed into a closet under the stairs with blue lips and strange symbols carved into the wooden door of the closet. After that, the Midnight Club hid all the evidence of their gameplay, disbanded, and went their separate ways. 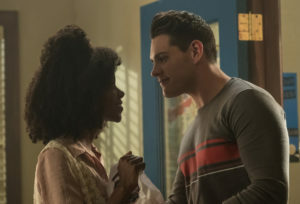 Alice became a good girl and started seeing Hal Cooper, FP joined the Serpents like his daddy, Penelope ran into the arms of Clifford for protection, Hermione went against her mother and sought solace and riches in the arms of Hiram, Tom and Sierra split up due to pressure from their parents, and Fred joined the family business and sold his guitar. The thing about that night is no one knows who put the poison in the chalices and who was supposed to drink from them. Daryl thought Penelope set up the event and she thought he did it because everything was already set up when Penelope got there. The mystery deepens as that crime was never solved: it was ruled a suicide under suspicious circumstances. 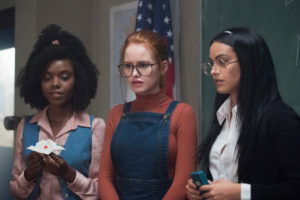 Flash forward to the present and Betty has fact-checked her mother’s story and rushes to tell Jughead when she comes upon Cheryl, Toni, Sweet Pea, Fangs and Jughead playing the game in Dilton’s bunker. Jughead seems drunk with power from the game and says everything is making sense and it’s only a matter of time before he ascends to meet the Gargoyle King. Yikes. Penelope was adopted by the Blossom family from The Sister’s of Quiet Mercy Orphanage (we hate that place!!) and was groomed to be Clifford’s “sister” and then his wife. This is when Fred and Hermione “dated” in school. We know this as the time when Alice was pregnant by FP Jones. The chalices were hidden in the trophy case, in plain sight. Does anyone else wonder how all the copies of Gryphons and Gargoyles made it into everyone’s school locker?